Our SAE battery leads can handle 10 amps of current. Other SAE battery leads use thinner wire and 3 amp fused. The 18 awg pure copper wire is a must to power SAE type heated clothing. An excellent choice for Luggage Electrix™. 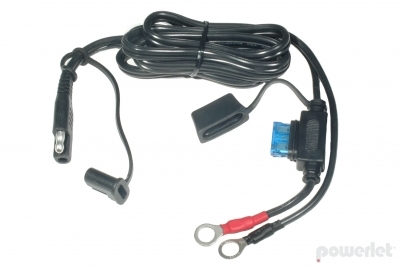 Includes 10 amp fuse and tethered dust cap. Avail 24" & 48"